Tomorrow, Palm will cease to be an independent company and become a division of HP. Many have said that this is a failure of their new strategy surrounding webOS and their attempt to signal a rebirth of a company. I tend to disagree, to my eyes for the past few years Palm was essentially a startup company and achieved one of the two possible good outcomes for any startup: getting acquired by a larger company who sees tremendous value in your product and your people. I have been a Palm user for ten years now, having purchased my first Palm III secondhand in 2000. A year later I joined VisorCentral and became a part of one of the most enriching and supportive communities of people I have ever encountered: the Palm user community. Handspring, the creators of the Visor and eventually the Treo, were to my eyes the heart and soul of Palm even though they didn't have the company name. From the get-go, the entire idea behind Handspring's Visor was that it was eventually meant to be a smartphone - the modular expansion behind the Visor called out for the VisorPhone and the first Treos were, in fact, nothing more than VisorPhones compressed down into smaller packages. 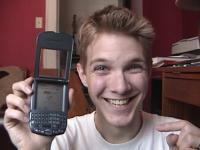 Since then we've seen various iterations of the Treo, seen Palm buy Handspring, seen them spin off their software division into irrelevance, seen them partner with Microsoft, seen them try to think big about the cloud with Foleo, seen them fall nearly as far as a company can, seen them bounce back with an even bigger idea in webOS. That's me at right, over eight years ago when I won the first Treo 180 from VisorCentral / TreoCentral. Yes, I was excited (and young) there - but it wasn't just the fun of getting a new gadget. I was (and am) excited by the possibilities of smartphones - the connections they can create and foster, the information they are a gateway to, and how they are a part of who we are becoming. When I say that I have been a "Palm user" for 10 years, I don't just mean specifically a user of Palm's products, but somebody who has been trying to live a new kind of life, somebody who is trying to be a new kind of person. There's a real problem in describing this new kind of identity because it's wrapped up on the one hand with often-overblown ideas of the pending post-human singularity and on the other with marketing terms that are denuded of their power by repetition and commerce. Connected. Cloud. Social. Synergy. Heck, this is why I begin every PalmCast with "Greetings Mobile Accomplishers," it's a term from the launch of Palm's Centro that is mostly empty, but buried in there is a truth: we are what we do, and what we do is increasingly mobile and interconnected. Our sense of what it means to talk to our loved ones is different now - they are both further away but more present, in a faraway places but in our pockets. Our sense of what it means to live in a community is different now - we have never met our next door neighbors but have close friends on Facebook, we chat on Twitter instead of at the watercooler. Our sense of what it means to be present in a place is different now - we have digital maps instead of asking directions, we have crowdsourced advice on the best restaurants. Our sense of what it means to conduct business is different now - we know our messages are going to a device on that person's body and not to an office somewhere, we alternately demand instant response and accept long delays due to information overload. Our sense of what it means to know and remember is different now - we put our pictures online, we fire up Google for random facts, we can store essentially infinite amounts of information in our pockets, we archive our thoughts on blogs. I could go on, but I hope the point is clear - the aggregate of all this possibility in the Palm of our hand changes us. The effect is multiplied, exponentially, by combining it with the web. Who are we if we have a version of the summed experiences and knowledge and loves and battles and identities of humanity (or the connected part of it, anyway) with us at all times, available with a gesture? We live in a world whose contours are increasingly defined by corporations. That's just the way it is - we are using devices that are changing who we are and these devices are made by companies looking to make a buck. Still, if these companies can think big about what they're selling, it opens up possibilities. Whatever we are becoming, it's different and new. We need to reorient ourselves to it and it is going to require new thinking. That's what I mean by being a "Palm user." It's not about Palm the company, it's about what they've attempted (with limited success) to do: think big about mobility (RIP KIN). It's the immediacy of communication made possible by the BlackBerry. It's the natural human interaction the iPhone pioneered. It's the ability to get simple banking done on a Nokia in a place where there isn't even a landline. It's the power to have your digital life up in the cloud synced to an Android phone. Palm got it right early with the Pilot - they knew that entering this new digital world required a radical simplicity in the interface. Handspring got it right with the Treo - they knew that our personal digital archives/extensions/assistants needed to be wireless and be able to do multiple things. Finally, Palm got it right with webOS. They knew that the combination of a connected device and the web is precisely what's empowering this new kind of identity, so they baked it right into the OS. A smartphone without the web is just a PDA with a phone attached; the web is integral to what makes smartphones matter. Palm also made it easier to switch between the different ways that we interact with the new digital world we are making. They left it open for us to hack on without having to work around arbitrary restrictions. Since we're clearly past bombastic and well into corny territory here, I'll straight up admit that I have two ways of looking at phones: there are features that are neat and there are new ways of being. Apple's FaceTime is a good example: it's a feature that is neat, but it's implemented to so well it has the potential to redefine how people interact with each other, how they are. That's why I love webOS, it has higher ambitions. Its openness, web-centric design, and even its visual interface are not just a collection of features. HP acquired more than just a nice mobile OS when they bought Palm, they got the platform whose form most closely follows the function of what it means to be a person in an interconnected, web-connected world. The implementation isn't there yet, but it has potential, as much or more than any other smartphone platform. So tonight is Palm's last night on earth, tomorrow they become a part of HP. When I say "Palm is dead, long live Palm," I am expressing a genuine sadness that they couldn't survive on their own as a scrappy little fighter in the suddenly gargantuan world of smartphones. I hope the spirit of Palm lives on at HP, even if the independent company does not. We have precious few people thinking big about what smartphones are and how they are changing us. Here's to hoping that HP/Palm keeps doing it.